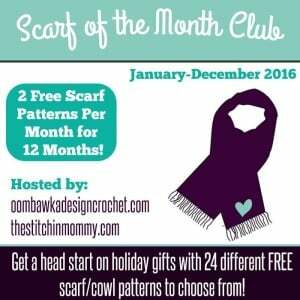 Welcome to the December Scarf of the Month Club Free Pattern! This month I have crocheted another 1-skein project for you to make as a quick last minute gift! This is crocheted with one of the large Charisma Rugby Yarn Balls 218 yds/7 oz. 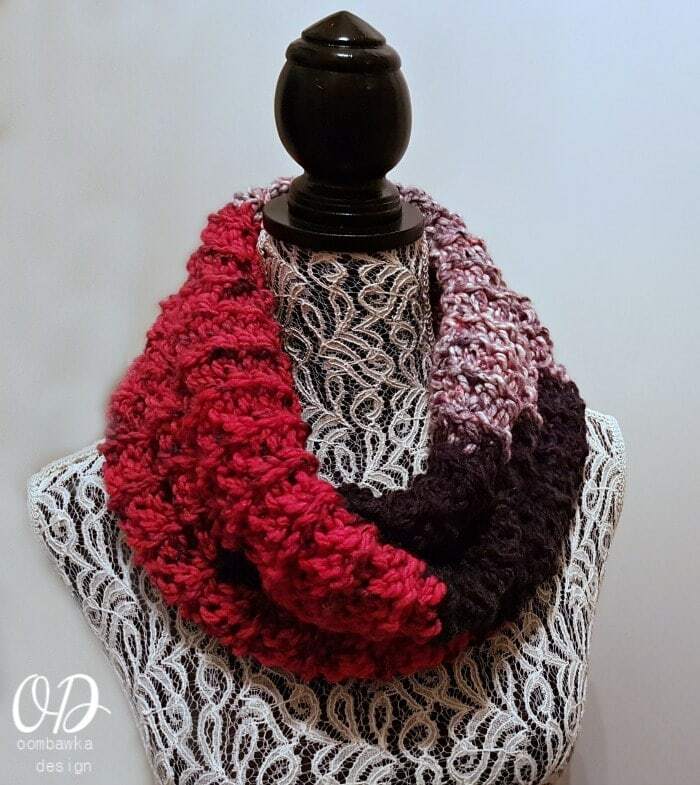 The yarn is super soft, bulky yarn and this pattern can be worked up in a single evening. The stitch pattern is easy to remember and you will enjoy making this while watching your favorite show on tv. 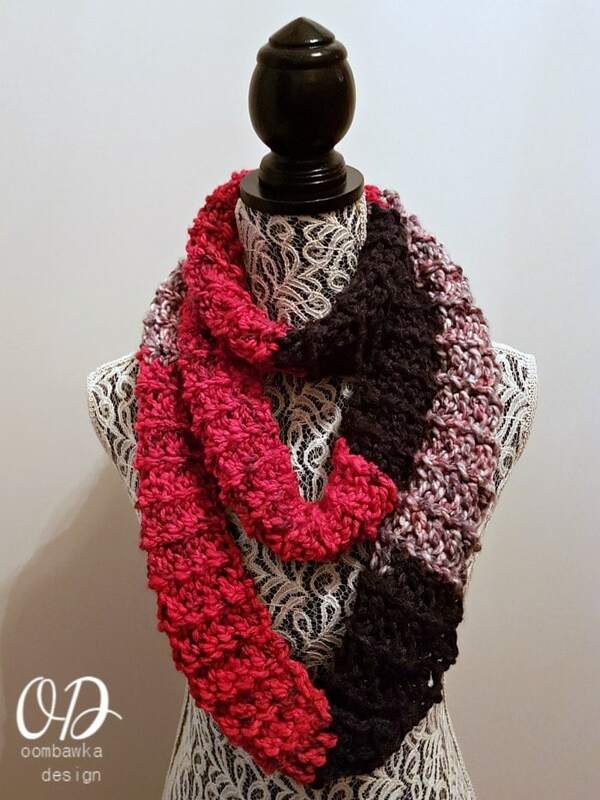 This is just one of the Scarf of the Month Club Free Patterns for the month of December 2016! 5 inches wide by 80 inches long. You will use the entire ball of yarn for this project. I chose to whipstitch my 2 ends together to make this an infinity scarf. Ch 1 (turning chain) does not count as a stitch and you do not work into it. Do not work into the ch1sp. All single crochet stitches EXCEPT THE FIRST AND LAST OF EACH ROW are worked into the back loop only of the indicated stitch. Note: The first sc and the last sc of each row are worked as regular sc stitches – under BOTH LOOPS. All other single crochet stitches are worked under the back loop only. This gives the scarf it’s lovely stretchy quality. Rep R2 until you run out of yarn! My scarf measured 80 inches in length when I only had enough to whip stitch the ends together. Finish off and either weave in your ends or whipstitch the two ends together to make an infinity scarf. Have fun! Thank you for all your hard work and generosity throughout 2016 with these monthly free, creative, scarf patterns. On a selfish note, am hoping to see this idea continue in 2017!